By Christian Friedrich Schulze. 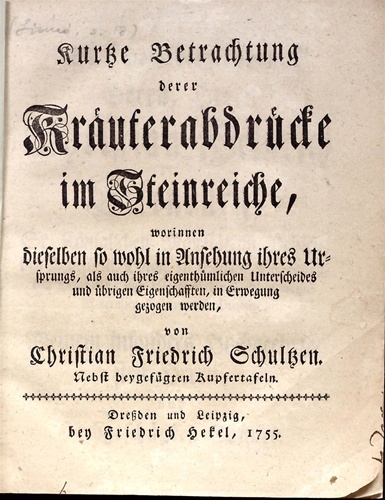 Dressden und ;: bey Friedrich Hekel, 1755. Schulze, a German physician (1730-1775) with interests in mineralogy and paleontology, was a pioneer of paleobotany, the study of fossil plants. He is credited with recognizing the true nature of fossils, rejecting the supernatural explanations that had held sway for centuries. 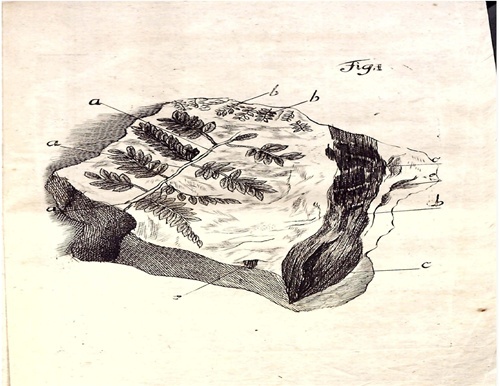 The Smithsonian Libraries already holds a related publication by Schulze concerning fossil woods; this one is on plants more generally, and the six copper plate engravings in the book are some of the earliest published images of plants preserved in rock sediments. The work is quite scarce, being held by only 8 libraries in the US, and is of particular interest to paleobotanists at the Smithsonian.